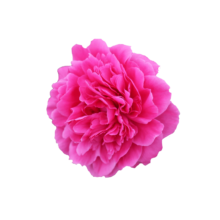 Pink Panther is a cheerful, early peony with a striking, bright pink colour. Pink Panther is a full-petalled, double-flowered, bomb-shaped peony. Varieties of this type often have small buds that grow into unexpectedly large flowers. Pink Panther is no different; the flowers can reach a diameter of about 15 cm! This variety is easy to put in a vase, thanks to its strong and healthy stems. Retailers are very happy with Pink Panther; it’s one of the earliest double-flowered peonies available and, because of this, is gaining popularity amongst consumers. Fortunately, we can deliver this wonderful peony variety in large volumes and of consistent quality. Pink Panther is a Dutch breed, but that’s all we know about this variety. Any tips? Let us know! You’ll have our eternal gratitude. A striking colour, easy to buy and just as pretty on its own as in a bouquet to boot. It’s no wonder Pink Panther is a top-selling peony! Cut the stems diagonally, remove the lower leaves and put Pink Panther in lukewarm water.